Some car manufacturers market their luxury models using the same marque as the rest of their models. Other manufacturers market their luxury models separately under a different marque, for example Lexus (launched by Toyota in 1989) and Bentley (purchased by Volkswagen in 1998). Occasionally, a luxury car is initially sold under a mainstream marque and is later re-branded under a specific luxury marque (for example the Hyundai Genesis / Genesis G80). For mass-produced luxury cars, sharing of platforms or components with other models is common, as per modern automotive industry practice. Australia: Since the year 2000, the Federal Government's luxury car tax applies to new vehicles over a certain purchase price, with higher thresholds applying for cars considered as fuel efficient. As of 2019, the thresholds were approximately AU$66,000 (US$51,000) for normal cars and AU$76,000 (US$58,000) for fuel efficient cars. Europe: Luxury cars are classified as F-segment vehicles in the European Commission classification scheme. France: The term "voiture de luxe" is used for luxury cars. Germany: The term German: Oberklasse (upper class) is used for luxury cars. Russia: The term (автомобиль представительского класса ("representative class vehicle, also translated as luxury vehicle) is used for luxury cars. Rental cars: The ACRISS Car Classification Code is a system used by many car rental companies to define equivalent vehicles across brands. This system includes "Luxury" and "Luxury Elite" categories (along with "Premium" and "Premium Elite" categoryies). The criteria for a vehicle to be considered "luxury" is not published. Examples include the Alfa Romeo Giulietta, Audi A3, Buick Verano, BMW 1 Series, Lexus CT 200h, Infiniti Q30, Mercedes-Benz A-Class, Mercedes-Benz B-Class, Volvo C30, Volvo V40, and BMW i3. Premium compacts compete with well-equipped mid-size cars, and highly optioned premium compact cars can have pricing and features that operlaps with compact executive cars. A compact executive car is a premium car smaller than an executive car. In European classification, compact executive cars are part of the D-segment. In North American terms, close equivalents are "compact premium car", "compact luxury car", "entry-level luxury car" and "near-luxury car". Executive car is a British term for an automobile larger than a large family car. In official use, the term is adopted by Euro NCAP, a European organization founded to test for car safety. It is a passenger car classification defined by the European Commission. The next category of luxury cars is known in Great Britain as a luxury saloon or luxury limousine, and is known in the United States as a full-size luxury sedan or large luxury sedan. It is the equivalent of the European F-segment and German Oberklasse segment. Many of these luxury saloons are the flagship for the marque and therefore include the newest automotive technology. Several models are available in long-wheelbase versions, which provide additional rear legroom and often a higher level of standard features. Examples of luxury saloons / full-size luxury sedans include the BMW 7 Series, Cadillac CT6 Genesis G90, Mercedes-Benz S-Class, Lexus LS, and Porsche Panamera. Luxury cars costing over US$100,000 (as of 2007) can be considered as "ultra-luxury cars". Examples include the Rolls-Royce Phantom, Maybach 57 and Bentley Arnage. Exotic cars which are targeted towards performance rather than luxury are not usually classified as ultra-luxury cars, even when their cost is greater than US$100,000. Several entry-level models from low-volume luxury car manufacturers, such as the Bentley Continental GT and the Rolls-Royce Ghost have been described as "entry-opulent" cars. Many ultra-luxury cars are produced by brands with a long history of manufacturing luxury cars. The history of a brand and the exclusivity of a particular model can result in price premiums compared to luxury cars with similar features from less prestigious manufacturers. V12 engines (or W12 engines for Volkswagen Group brands) are common in ultra-luxury cars. Another precursor to the luxury SUV is the Range Rover, which was released in 1970. It was the first road-going vehicle to have a permanent four-wheel drive system, split tailgate, clamshell bonnet and continuous waistline. The Range Rover had long-travel coil spring suspension and an aluminium V8 engine. Development of the Range Rover began in 1951. In the mid 1990s, the SUV market expanded with new entrants. By the mid-1990s, the Ford Explorer and Jeep Grand Cherokee were the market leaders for SUVs. The fastest growing sector of this market was for the so-called luxury SUVs, which included the Jeep Grand Cherokee ... the Grand Cherokee's allure: "This vehicle is proof you can have a true off-road vehicle without giving up luxuries and amenities" with the Jeep providing a crucial new intangible factor for buyers—image. The SUV models generated higher profit-margins than passenger cars, and automakers introduced new luxury models during the late 1990s, starting with Lincoln Navigator in 1997, besides traditional models like the Grand Cherokee. For some manufacturers such as Porsche and BMW, luxury SUVs were the first SUV models they produced. Luxury SUVs catered particularly to the U.S. market where station wagons were unpopular, often being produced in North America (such as BMW Spartanburg) instead of the luxury marque's home country. Some of these models were a unibody construction, instead of the body-on-frame construction traditionally used by off-road vehicles. During the mid-2000s, SUVs from luxury car brands grew at almost 40 percent in the United States to more than 430,000 vehicles (excluding SUV-only brands like Hummer and Land Rover), at a time when luxury car sales suffered a 1% decline, and non-luxury SUV sales were flat. By 2004, 30 percent of major luxury brands' U.S. sales were SUVs. Crossover SUVs became increasingly popular in the mid-2000s, and manufacturers also began to produce luxury versions of crossovers. The Lexus RX was the earliest luxury crossover on the market, and it has since been the best-selling luxury vehicle in the US. Some luxury crossovers are built on a platform shared with sedans or hatchbacks, for example the Infiniti FX is based upon the Nissan FM platform that also underpins other Infiniti cars. While early luxury crossovers released in the late 1990s have resembled traditional boxy SUVs, more recent crossovers, such as the Infiniti FX and BMW X6, have been designed with a sporting appearance. Despite the increased popularity of crossover models, luxury versions of traditional SUVs remain in production, often being badge-engineered versions of their non-luxury SUVs. Examples include the Lexus LX, Infiniti QX80 and Lincoln Navigator, which are the premium versions of the Toyota Land Cruiser, Nissan Patrol and Ford Expedition respectively. Research data from the mid-2000s suggested that luxury SUV buyers did not consider traditional luxury cars (e.g. sedans and coupes), therefore the SUV is becoming the key to bringing new customers to the luxury dealerships. Luxury vehicles can be a status symbol for conspicuous consumption; however many European luxury car buyers shy away from conspicuous consumption, therefore brands offer buyers the option of removing exterior badges that identify the model name or engine size. The suspension system of most luxury cars is tuned to prioritise ride quality over handling, however some cars are marketed as "sports luxury" and have greater emphasis on handling characteristics. Traditionally, luxury cars have used a front-engine, rear-wheel drive (FR) layout. The FR layout is more expensive to produce and produces lower fuel economy than a front-wheel drive layout, however it allows for larger engines (particularly straight-six, V8, and V12) to be used. Since the introduction of the Bentley Continental GT in 2003, an increasing number of luxury cars have used all-wheel drive. Many American luxury cars from the 1970s to the 1990s switched to a front-wheel drive layout with transverse engine, due to the Arab Oil Embargo of 1973 and the 1979 fuel crises which eliminated many FR platforms in favor of the more economical front-wheel drive (FF) layout. From the early 2000s, several of these American luxury cars reverted to FR layouts. 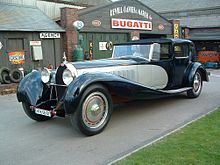 Prior to World War II, a wide array of European producers made luxury cars, including Rolls-Royce Limited, Bugatti, Delage, Delahaye, Talbot-Lago and Isotta Fraschini. France was a leading producer of powerful luxury automobiles prior to World War II. After World War II, the French government used puissance fiscale tax regulations to encourage manufacturers to build cars with small engines, and French motorists to buy them. The Maserati-powered Citroën SM and the Citroën C6 were arguably the last domestic French luxury cars. In the 2010s, some French manufacturers have attempted to develop luxury cars, however the lack of a historical legacy has hindered these efforts. In 2014, Citroën introduced DS Automobiles sub-brand to market luxury cars. Following World War II, Germany rose to become an export powerhouse, building on success with the Mercedes-Benz brand, later joined by BMW, which now owns Rolls-Royce Motor Cars, and Volkswagen, which now owns Audi, Bentley, and Lamborghini. In the Soviet Union, the manufacturer ZiL (then called Zis) began producing limousines in the mid-1930s and GAZ and joined the luxury car market in the early 1950s. 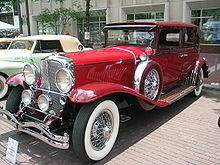 Prior to World War II, Americans manufacturers built the Duesenberg, Packard, Pierce Arrow, Stutz, Stearns-Knight, Cadillac, Chrysler, Lincoln and Cord luxury models. Most of them had a V8, V12 or V16 engine. From 1946 to the late 1990s, Cadillac was the highest selling brand of luxury cars in the U.S. and Lincoln Motor Company was the second-highest. Since the late 1990s, Japanese and German brands have sold the most luxury cars in the U.S. In 2010, BMW was the best-selling luxury vehicle manufacturer by sales, with Audi and Mercedes-Benz the second and third highest selling luxury brands. In the late 2000s, the Cadillac CTS and Cadillac DTS led to a resurgence in the brand's luxury sedans. The equivalent sedan from the Ford group, the 2008 Lincoln MKS, was also regarded as a significant improvement over previous models. American-built luxury cars have largely been intended for the North American market only, with few models achieving sales success in other countries. The personal luxury car is an America-specific category of car that reached peak popularity in the 1970s. The cars were stylized, mass produced 2 door coupés or convertibles, relying on standard components. Japanese manufacturers have been producing luxury cars since the 1950s, including the Toyota Crown (1955-present), Prince/Nissan Gloria (1959-2004), Nissan Cedric (1960-2015), Mitsubishi Debonair (1964-1998), Nissan President (1965-2010), Toyota Century (1967-present), Mazda Luce/929 (1969-1991) and Honda Legend (1985-present). Since the 1980s, overseas sales of a Japanese luxury cars have increased, challenging the traditional European luxury brands. Several Asian manufacturers have created sub-brands for the marketing of luxury cars. The first of these was the 1986 launch of Acura (a Honda sub-brand), followed by Lexus (Toyota) in 1989, Infiniti (Nissan) in 1989 and Genesis (Hyundai) in 2015. The late-2000s global financial crisis was the first time since the Great Depression of the 1930s that the luxury car market suffered considerably, something not seen in previous economic downturns. Many such customers saw their net worth decline following the collapse in financial markets and real-estate values. For example, some of the steepest dropoffs came at the high end, including the BMW 7 Series and Rolls-Royce Phantom, and in 2010 Mercedes-Benz unexpectedly dropped the price of the W212 E-Class. The unusually sharp decline in luxury car sales have led observers to believe that there is a fundamental shift and reshaping of the luxury automotive market, with one industry official suggesting that the marques no longer command the premiums that they used to, and another saying that conspicuous consumption was no longer attractive in poor economic conditions. Additionally, mainstream brands have been able to offer amenities and devices such as leather, wood, and anti-lock brakes, previously found only on luxury cars, as the costs decline. However, luxury vehicle sales did not collapse as much as their non-luxury counterparts. This was aided by growing interest in luxury vehicles from emerging markets such as China and Russia. Sales in the entry-level luxury segment remained strong throughout the GFC, due to prices being lowered to compete with well-equipped non-luxury cars. For example, in Canada, several luxury manufacturers set sales records in August 2009, due mostly to aggressive incentives on entry-level luxury vehicles. In September 2009, BMW, Mercedes-Benz, Lexus and Audi all saw their Canadian sales increase by more than 10 per cent compared to a year earlier, despite overall Canadian auto sales being down 3.5 per cent compared to September 2008. ^ a b Anurit, Jakrapan; Newman, Karin; Chansarkar, Bal. "Consumer Behaviour of Luxury Automobiles: A Comparative Study between Thai and UK Customers' Perceptions" (PDF). Economics Web Institute. Retrieved 11 March 2014. ^ Kapferer, Jean-Noël; Bastien, Vincent (2009). The Luxury Strategy: Break the Rules of Marketing to Build Luxury Brands. Kogan Page. p. 43. ISBN 9780749454777. ^ Roe, Fred (1986). Duesenberg - The Pursuit of Perfection. Dalton Watson. ISBN 978-0-901564-37-5. ^ "1930 Isotta Fraschini Tipo 8A news, pictures, and information". conceptcarz.com. Retrieved 11 March 2014. ^ a b "The History of Lexus" (Press release). US: Lexus. 19 April 2013. Retrieved 10 January 2019. ^ "A Look at Bentley Through the Ages". www.robbreport.com. Retrieved 6 January 2019. ^ "Bentley History". www.rolls-royceandbentley.co.uk. Retrieved 6 January 2019. ^ "Hyundai Genesis Review". Car and Driver. US. Retrieved 22 March 2016. ^ Lorio, Joe (4 November 2015). "Genesis 2.0: Hyundai's Genesis to Become Separate Luxury Brand". Car and Driver. US. Retrieved 22 March 2016. ^ Wendler, Andrew (January 2012). "2013 Acura ILX Concept - This concept previews a production Civic-based compact for Honda's luxury brand". Car and Driver. Retrieved 11 March 2014. ^ "Tax Laws Amendment (Luxury Car Tax) Bill 2008". Australian Government ComLaw. 13 June 2008. Retrieved 23 August 2014. ^ "The breakdown: Luxury Car Tax - Why luxury cars cost too much in Australia". Drive. 8 June 2017. Retrieved 8 January 2019. ^ "Luxury car tax rate and thresholds". www.ato.gov.au. Retrieved 8 January 2019. ^ "Case No COMP/M.1406 - Hyundai/Kia - Regulation (EEC) No 4064/89 Merger Procedure" (PDF). Office for Official Publications of the European Communities. 17 March 1999. Retrieved 11 March 2014. ^ "Case No IV/M.1326 - Toyota/Daihatsu - Merger Decision IV/M.1326" (PDF). Office for Official Publications of the European Communities. 6 November 1998. Retrieved 11 March 2014. ^ "Case No COMP/M.5219 - VWAG/OFH/VWGI - Regulation (EC) No 139/2004 Merger Procedure" (PDF). Office for Official Publications of the European Communities. 25 November 2008. Retrieved 11 March 2014. ^ Mingot, Leo (14 September 2012). "Ecologie: les reines du CO2" (in French). Auto News Fr. Archived from the original on 19 April 2012. Retrieved 11 March 2014. ^ "Crashtest: Obere Mittelklasse Übersicht A - Z" (in German). ÖAMTC. Retrieved 11 March 2014. ^ "Car of the Year Russia". 2015. ^ "ACRISS Car Classification Code". www.autocardatabase.com. Retrieved 7 December 2018. ^ "2014 Mercedes-Benz CLA-Class Review". Edmunds.com. Retrieved 11 March 2014. ^ "Compact Premium Rental in United Kingdom". www.alamo.com. Retrieved 10 January 2019. ^ "Daimler-Nissan JV To Build Next-Gen CLA, Unnamed A-Class At Mexican Plant". www.thetruthaboutcars.com. 24 June 2014. Retrieved 10 January 2019. ^ "2011 AutoPacific Ideal Vehicle Awards: Premium Compact Car". www.autobytel.com. Retrieved 10 January 2019. ^ Proudfoot, Dan (10 September 2012). "Audi luxury compact is ready for the future". The Globe and Mail. Toronto. Retrieved 11 March 2014. ^ Kane, Mark (21 February 2019). "Electric Cars Outsell Hybrids In California: Tesla Model 3 Tops In Class". Inside EVs. Retrieved 22 February 2019. ^ Cato, Jeremy (29 November 2013). "Uptown Runs Downtown with Less Expensive Autos". ClassifiedsTT. Retrieved 11 March 2014. ^ Cotta, Rick (30 October 2008). "The Consumer Guide to 2008 Premium Compact Cars". Consumer Guide Automotive. Archived from the original on 9 November 2008. Retrieved 25 April 2012. ^ "Car Rankings: Best Upscale Midsize Cars - Best Cars & Trucks". U.S. News and World Report. U.S. News Rankings & Reviews. Archived from the original on 2015-04-08. Retrieved 2015-04-08. ^ "Jaguar XJ Review (2019)". www.autocar.co.uk. Retrieved 13 January 2019. ^ "Mercedes-Benz S-Class saloon review". www.parkers.co.uk. Retrieved 13 January 2019. ^ "New Audi A8 55 TFSI 2018 review". www.autoexpress.co.uk. Retrieved 13 January 2019. ^ "Lexus LS 500h Saloon (2017 - ) review". www.autotrader.co.uk. Retrieved 13 January 2019. ^ "2019 Audi A8 First Look". www.motortrend.com. Retrieved 13 January 2019. ^ "2019 Lexus LS 500: A suitably cushy flagship with a polarizing visual edge". www.autoweek.com. Retrieved 13 January 2019. ^ "2019 Infiniti Q70 Reviews". www.caranddriver.com. Retrieved 13 January 2019. ^ "2018 Genesis G90 Review, Ratings, Specs, Prices, and Photos". www.thecarconnection.com. Retrieved 13 January 2019. ^ "2010 Mercedes-Benz S-Class - Consumer Guide Automotive". luxuryvehiclealabama.tumblr.com. ^ Winfield, Barry (January 2007). "2006 Jaguar Super V-8 vs. 2007 M-B S550, 2006 Audi A8L, 2007 Lexus LS460L, 2006 BMW 750Li - Comparison Tests". Car and Driver. Retrieved 11 March 2014. ^ a b c "European sales 2017 Limousine segment". www.carsalesbase.com. Retrieved 13 January 2019. ^ a b c "US car sales analysis 2018 Q2 - Limousine segment". www.carsalesbase.com. 13 August 2018. Retrieved 13 January 2019. ^ a b c "Ultra-Luxury Cars". www.autos.msn.com. Archived from the original on 7 July 2014. ^ "18 of the Most Luxurious Cars You Can Buy". www.roadandtrack.com. 16 November 2018. Retrieved 15 January 2019. ^ Gall, Jared. "2010 Bentley Continental Flying Spur Speed vs. 2011 Rolls-Royce Ghost". www.caranddriver.com. Archived from the original on 23 October 2011. ^ Fuhrmans, Vanessa (8 August 2011). "A Handful of Maybachs Isn't Enough". The Wall Street Journal. Retrieved 11 March 2014. ^ Valdes-Dapena, Peter (4 April 2006). "Rolls-Royce vs. Maybach". CNN. Retrieved 11 March 2014. ^ Ulrich, Lawrence (30 September 2011). "A Threat to the Job Security of Chauffeurs". The New York Times. Retrieved 11 March 2014. ^ Vasilash, Gary S. (6 June 2007). "The Lexus LS 600H L: Not Just Another Production Car". Automotive Design and Production. Retrieved 11 March 2014. ^ Markus, Frank (July 2003). "2003 BMW 760Li vs. M-B S600 - Comparison Tests". Car and Driver. Retrieved 11 March 2014. ^ Kacher, Georg (April 2009). "2002-2006 BMW 760Li and 2001-2006 Mercedes-Benz S600". Automobile. Retrieved 11 March 2014. ^ "A Look Back at the History of the Jeep Wagoneer". www.miamilakesautomall.com. Retrieved 19 January 2019. ^ a b c d "1966 Jeep Wagoneer". www.howstuffworks.com. 29 August 2007. Retrieved 11 March 2014. ^ Foster, Patrick (January 2008). "1963 Jeep Wagoneer - Landmark Vehicle". 4 Wheel Drive & Sport Utility Magazine. Retrieved 11 March 2014. ^ "Range Rover: A History". www.landrover.com. Retrieved 19 January 2019. ^ "The Land Rover History: Timeline". www.winwaed.com. Retrieved 19 January 2019. ^ "History of the Range Rover: in pictures". www.msn.com. Retrieved 19 January 2019. ^ Oldham, Scott; Lamm, Michael (May 1996). "Happy 100th!". Popular Mechanics. 173 (5). Retrieved 11 March 2014. ^ Riggs, Thomas (2006). Encyclopedia of major marketing campaigns. 2. Gale Group. p. 390. ISBN 978-0-7876-7356-7. Retrieved 11 March 2014. ^ Frankel, Ernst G. (2006). Challenging American Leadership: Impact of National Quality on Risk of Losing Leadership. Springer-Verlag. p. 35. ISBN 978-1-4020-4892-0. ^ "Lincoln Navigator Rolls Out With Large Order Bank" (Press release). US: Ford. 14 May 1997. Retrieved 26 March 2018 – via The Auto Channel. ^ Gross, Ken (1 September 2000). "Lexus The Truckmaker". Automotive Industries. Archived from the original on 30 December 2008. Retrieved 15 November 2008. ^ Laturnus, Ted (23 August 2012). "'Bionic cheetah' married performance, practicality". Toronto: The Globe and Mail. Retrieved 11 March 2014. ^ "Inifiti FX35 Review (MY 2010)". Edmunds.com. 2009. Archived from the original on 11 December 2009. Retrieved 21 January 2010. ^ Thomas, David (15 September 2008). "2009 Infiniti FX35". cars.com. Retrieved 11 March 2014. ^ Dyer, Ezra (22 June 2008). "New-Age Mutant Ninja Wagons". The New York Times. Retrieved 11 March 2014. ^ "2014 Lexus LX Reviews, Pictures and Prices". U.S. News Rankings and Reviews. Retrieved 11 March 2014. ^ Isidore, Chris (7 January 2004). "Luxury SUVs: key to growth for luxury brands, SUV segment". Money.cnn.com. Retrieved 11 March 2014. ^ Lienert, D. (11 March 2007). "Safest Cars 2007". Forbes. Archived from the original on 1 June 2007. Retrieved 15 August 2007. ^ a b c Elliott, Hannah (27 February 2009). "Ten Reasons To Buy A Luxury Car". Forbes.com. Retrieved 11 March 2014. ^ a b Ulrich, Lawrence (13 August 2010). "In Some Classes, Buyers Are Not Ready to Give Up Their V-8s". The New York Times. Retrieved 11 March 2014. ^ Chase, Chris (9 September 2009). "Test Drive: 2009 BMW 328i xDrive". Autos. Canada. Retrieved 27 April 2016. ^ "2010 Buick LaCrosse CXS vs. 2009 Lexus ES 350 Comparison Test and Video on Inside Line". Edmunds.com. 30 August 2009. Archived from the original on 4 September 2009. Retrieved 14 September 2009. ^ "Automaker Ratings". Rearwheeldrive.org. Retrieved 29 September 2009. ^ Stewart, Ben. "Comparison Test: Front-Wheel Drive Vs. Rear-Wheel Drive". Popular Mechanics. Retrieved 29 September 2009. ^ "U.S. luxury car manufacturers are rethinking rear wheel drive]. (Auto Weekend)". The Washington Times. Washington, D.C.: Highbeam.com. 13 October 2009. Retrieved 17 January 2011. ^ Meredith, Robyn (12 November 1999). "The media: Advertising: Cadillac is redesigning its image before its retooled cars appear". The New York Times. Retrieved 14 September 2012. ^ Kaus, Mickey (9 May 2003). "Chrysler brings back rear-wheel drive". Slate. Retrieved 11 March 2014. ^ Johnson, Drew (14 February 2008). "2011 Chrysler 300, Dodge Charger to remain rear-wheel drive". Leftlanenews. Retrieved 11 March 2014. ^ "Lincoln Town Car wins stay of execution". Spero News. 19 September 2006. Retrieved 11 March 2014. ^ a b Sedgwick, Michael (1 March 2017). "The Facel Vega 1954 - 1964". www.facel-vega.com. Retrieved 1 February 2018. ^ "Is The French Luxury Car Finally Back ?". Oppositelock. 9 April 2014. Retrieved 1 February 2018. ^ Holloway, Hilton (12 December 2012). "Is it time to bid adieu to the French luxury car?". www.autocar.co.uk. Retrieved 1 February 2018. ^ Schechner, Sam; Pearson, David (5 October 2012). "French Begin New Luxury Car Drive". Wall Street Journal. Retrieved 1 February 2018. ^ "DS range: Our current vehicles". DS. Retrieved 1 February 2018. ^ Barry, Maggie (18 January 2018). "DS 7 - lighting the way and pushing ahead". Scottish Daily Record. Retrieved 1 February 2018. ^ O'Dell, John (6 May 1999). "Cadillac Apologizes to Lincoln for Inflating Sales Numbers". Los Angeles Times. Retrieved 11 March 2014. ^ "3rd UPDATE: BMW Lifts 2010 Guidance As Demand Improves". Online.wsj.com. 13 June 2010. Archived from the original on 28 July 2010. Retrieved 15 March 2014. ^ Lienert, Dan (12 December 2005). "Best-Selling Luxury Cars 2005". Forbes.com. Retrieved 11 March 2014. ^ English, Bob (24 June 2009). "Lincoln measures up to stiff competition". The Globe and Mail. Toronto. Retrieved 11 March 2014. ^ "What's The Ultimate Personal Luxury Car?". Jalopnik. Retrieved 30 January 2019. ^ "Toyota - history of the car company". www.toyoland.com. Retrieved 25 January 2019. ^ "History of the Toyota Crown". www.toyota.co.uk. 6 August 2015. Retrieved 25 January 2019. ^ a b c d e Eisenstein, Paul A. (18 September 2009). "Luxury car market may never look the same". MSNBC. Retrieved 11 March 2014. ^ Gupta, Poornima (11 September 2009). "Bentley sees signs of revival in luxury car class". Reuters. Retrieved 11 March 2014. ^ "Drop in Germany luxury car sales eases". AFP. 8 September 2009. Archived from the original on 11 December 2011. Retrieved 11 March 2014. ^ Rogoski, Richard R. (1 December 2008). "Recession not a roadblock for luxury-car sales". Triangle Business Journal. Retrieved 11 March 2014. ^ Van, Nicolas (8 September 2009). "Luxury makers smash August sales records in Canada". Ottawa Citizen. Archived from the original on 20 March 2012. Retrieved 11 March 2014. ^ Van, Nicolas (4 June 2009). "Luxury makers smash August sales records in Canada". Ottawacitizen.com. Archived from the original on 20 March 2012. Retrieved 10 September 2009. ^ Vaughan, Michael (9 September 2009). "Incentives are 'an expensive way to sell'". The Globe and Mail. Toronto. Retrieved 14 September 2012.